Hello, fall! As the leaves slowly begin to change colors, the mornings get cooler, and pumpkin pandemonium (as I like to call it) descends, I know fall has officially arrived. While I love all of the cozy knits that come with the chilly weather, the emergence of booties, and the darker hues that are seen on everything from fingers to fashion, I also like to change up my accessories with the season. When JORD Watches approached me to partner with them, I was beyond excited. 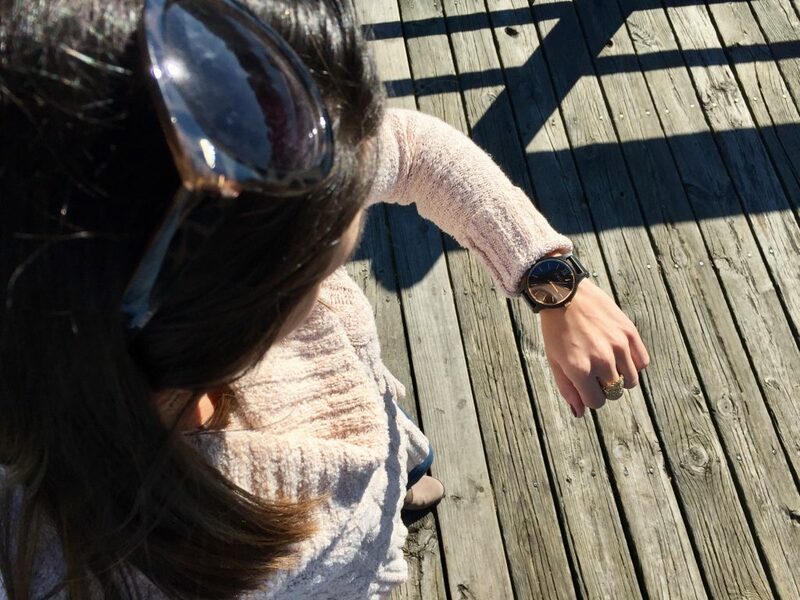 I have long been eyeing their beautiful wood watches…and secretly wanted one of my very own. 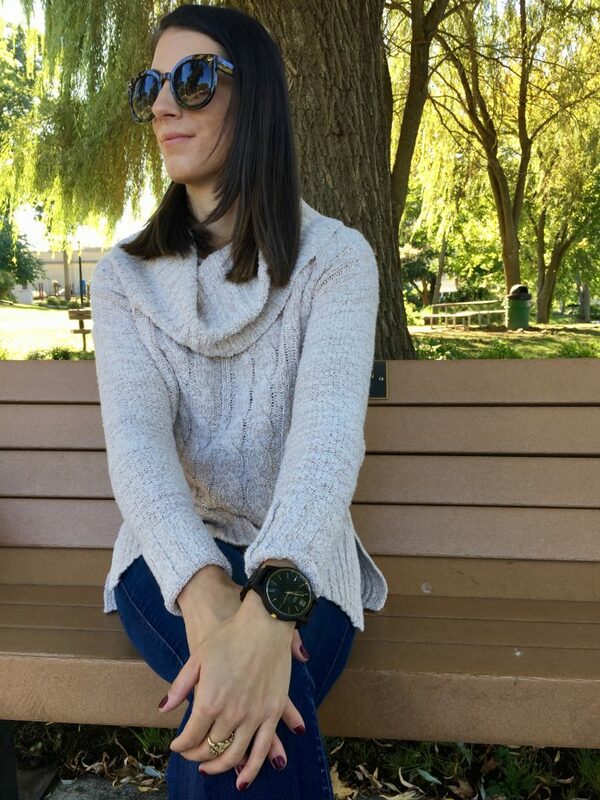 I love all of the choices they offer customers to create a one-of-a-kind timepiece—with woods from acacia to zebrawood to different face colors and sizes—there is a JORD style to suit every woman’s and man’s taste. After perusing JORDS site—trying to find the perfect watch for my petite wrist—I landed on the Frankie collection. Despite having a smaller wrist size, I tend to gravitate towards chunkier watches. 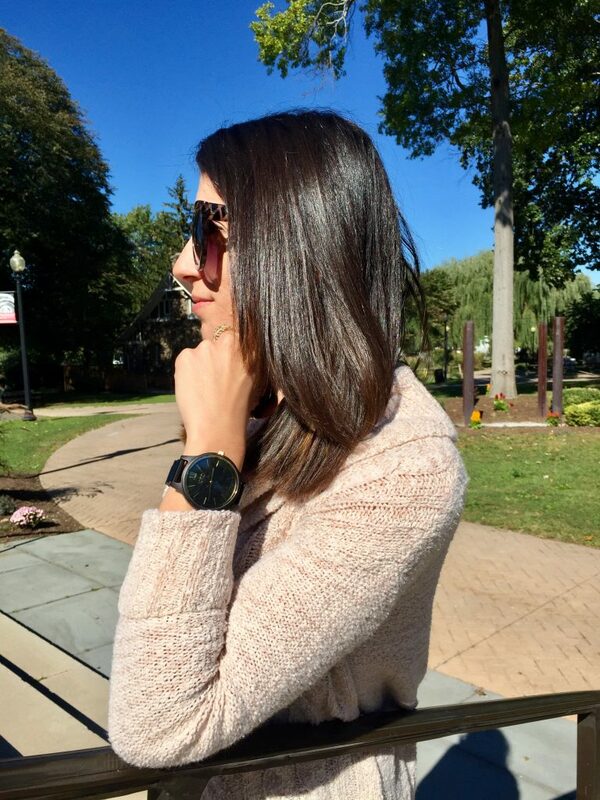 The Frankie collection had everything I look for in a watch—a large face, a little bling, and lots of face colors to choose from. I ultimately selected the Frankie watch in ebony and gold. I was drawn to the darker finish and I liked how the gold complemented the wood. Once I made my selection, I began counting down the minutes to when I would get to meet my Frankie in person. For me, the beauty of a JORD Watch doesn’t start with the watch itself. The first thing I noticed when I received my watch was the stunning wooden box that it came in, which I now use to display it. The box even has a drawer at the bottom for jewelry—talk about multi-functional. Inside the box, my Frankie watch was resting comfortably on a pillow. I immediately slipped it on my wrist and have been wearing it ever since. It is a unique timepiece and one that I constantly get compliments on. Out of my entire watch collection, my JORD watch is the one I reach for most often. 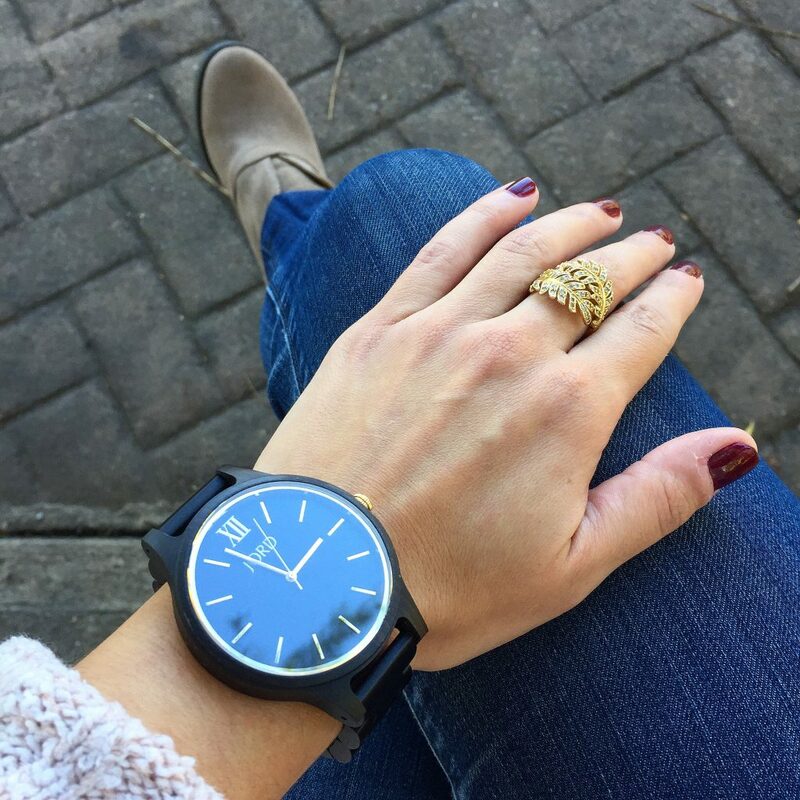 It is the perfect everyday watch, but it also completes every ensemble. Worried about how wood will wear—both in terms of texture and durability? Don’t be. JORD Watches can stand the test of time (no pun intended). JORD makes sure that all of their watches are built not only to last—but wear well. The ebony wood on my watch is hand-finished and pretreated with tung oil for extra protection. And the wood itself is lightweight, soft, and smooth, making it comfortable for daily wear. 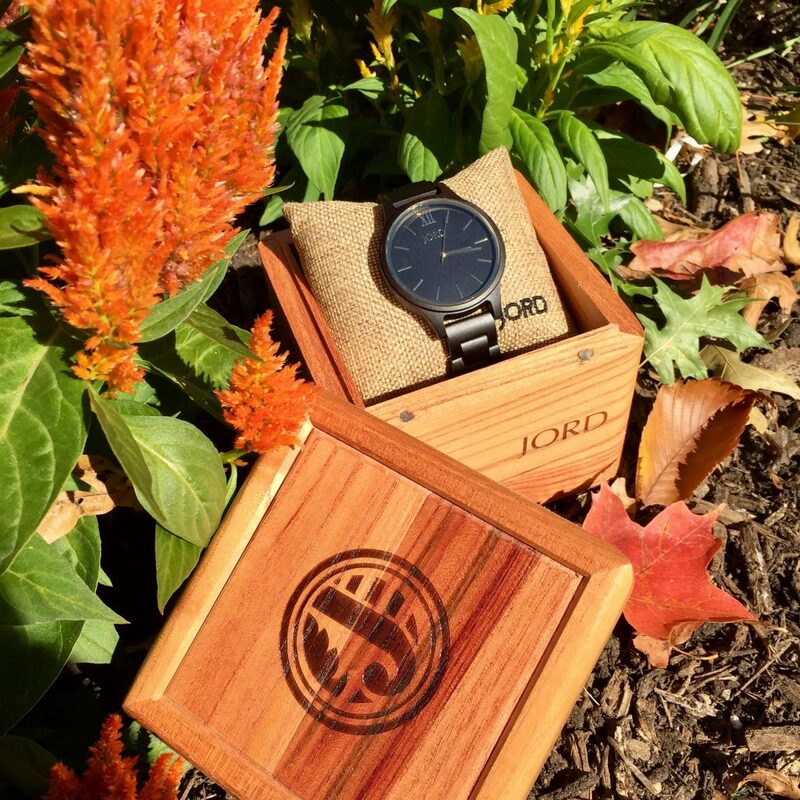 Is it time to get your own JORD Watch? Well, here’s how to get one. Every person who enters my giveaway before October 15th at 11:59 pm CST will have a chance to win a $100 gift code to use on the JORD site. One lucky person will win, but everyone will receive a consolation code worth $25 once the contest ends. Good luck! *This post is in collaboration with JORD Watches. All views and opinions are my own. Watch courtesy of JORD Watches. Love Jord watches! I have one and love how versatile it is. These are great photos because you are in them! 🙂 I entered the giveaway a couple of days ago. Have a wonderful weekend Vanessa! They are so versatile, Kathrine! And pretty, too. Aren’t they, Caitlin? I love my JORD watch. I find Jord Watches so pretty! How are they so far, are they really worth it? Totally worth it, Angelie! This is my favorite watch to date. Make sure you enter the giveaway! OMG! I love Jord watches as well, I have two actually. They feel so light and really beautiful. Aren’t they gorgeous, Jessica?! I love mine, too.